This dish makes me so happy. It has all my favourite flavours and lots of spice. It’s a low carb take of chili with corn bread. The “chili” part doesn’t have beans, but is packed with peppers and ground beef. 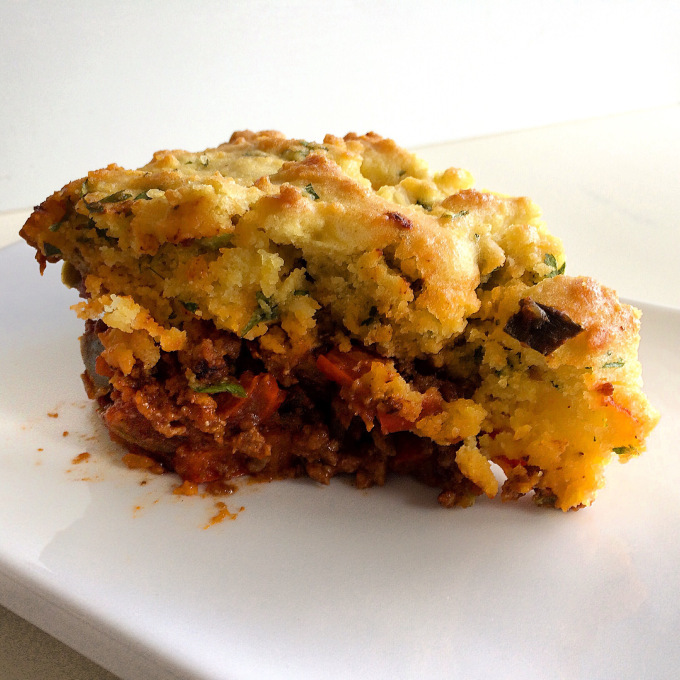 The “corn bread” is made with almond flour giving it the texture and taste without the carbs. It’s carbless comfort food at it’s best. In a large oven proof skillet on medium heat, sauté the onions in olive oil. Once softened, add the ground beef, garlic, cumin, paprika, salt, and oregano. Once beef has browned, add chopped bell peppers, jalapeno and chipotle peppers. Sauté until tender about 10 minutes. Add the tomatoes. Let simmer for 10 minutes. In a large bowl mix almond flour, salt, baking powder, garlic powder, herbs, and cheese. Add eggs, sour cream, and olive oil. Mix well. Add scallions and coriander to meat. Mix well and spread meat evenly in the pan to make a bed for the biscuits. Sprinkle 1/3 cup of grated cheese onto the meat and peppers. Spoon batter over the meat filling, putting scoops of batter evenly on top of the meat. They will expand while baking so no need to spread. Can’t handle the spice? Don’t add the chipotle and jalapeno peppers. I’m a spicy girl so I’m always adding heat to my dishes. This dish is spicy, but can be adjusted to your taste by reducing the amount of jalapenos and chipotle peppers.